The meaning of the Assumption is that of a culmination and a new beginning. With the Assumption, the promises of the Lord were fulfilled for Mary, and as always, beyond all expectation. Her glorification in body and soul resulted from divine graciousness and gracefulness. But it also came, so to speak, as the logical conclusion of her vocation on earth and the way she lived it. Her divine motherhood is in perfect harmony with her Assumption, as are her Immaculate Conception and perpetual virginity, both called for by her vocation as God-bearer. How could the body of her in whom "the Word was made flesh" to save the flesh have known the corruption of the grave? Or the body of her who totally escaped the power of sin? And the body of her who, by her virginal consecration, belonged to her Son and His mission in a perfect and exclusive way? If anyone has 'followed Christ' to the utmost, without the least failing, it is Mary. How, then, could He not but gather her with Him, body and soul, to the glory to which the Cross is the way and the portal? What other 'recompense' could be imagined for Mary than this immediate and total participation in the life of the Risen Lord? Yet, this personal culmination of Mary's experience is at the same time a new beginning. Mary is now in eternal life. This means the joy and blessedness that comes from loving and beholding the God who is Light, Life and Love. It also means the fullness of communion with all who love God, with all whom God loves. And God loves everything he has made, creation being the effect of his love. But though the blessedness of eternal life is true of all elect in heaven, it is true of Mary in a very special way, not only by reason of the perfection of her glory, but also because her Assumption enables her even now to live her blessedness in the fullness of her glorified humanity. And it does not mark the end of "service." On the contrary, her service could now assume its universal dimensions: "Taken up to heaven"--as Vatican II reminds us--"she did not lay aside her salvific duty ... By her maternal love she cares for the brethren of her son who still journey on earth." (Lumen Gentium 62) Yes, Mary is now in a position to exercise fully her "motherhood in the order of grace," without interruption until the eternal fulfillment of all the elect (LG 62). And it is not immaterial, here as always, that Mary's maternal love for us engages not only her soul but also all the powers of her human nature lifted up to glory. And so, the Assumpta becomes the Mother of the New World, and in an even deeper sense, the mother of the fullness of times marking, according to John Paul II, "the moment when, with the entrance of the eternal into time, time itself is redeemed, and being filled with the mystery of Christ becomes definitively salvation time." (Redemptoris Mater 1) The Church's often rugged journey happens and evolves, in the "fullness of time." "She proceeds along the path already trodden by the Virgin Mary, who advanced in her pilgrimage of faith, and loyally persevered in her union with her son unto the cross and beyond." (RM 2) This "fullness of time" exorcises the many doomsday scenarios of the day, and we can be sure, that where Mary--the true 'Morning Star'--proceeds, there is safe conduct for the pilgrim humanity and, above all, there will come the glorious rising of the "Sun of Justice." To all the Cassandras of Apocalypse and all the Sirens of Aquarius and Pisces, Mary proposes her own song, that is, the joyful awareness that God is the saving truth, that he is the source of every gift and also of the loving preference for the poor and the humble. And so the Magnificat becomes a manifesto of hope, an efficacious antidote against the destructive and corrosive Zeitgeist. Mary, Mother of the New World and Mother of the Fullness of Times is at our side on this Pilgrimage at the beginning of a new Millennium. 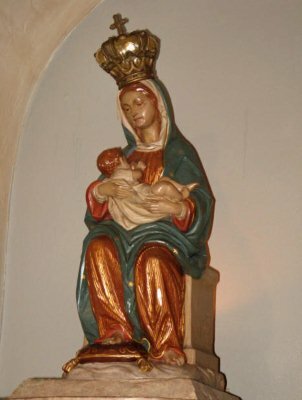 In 1620, early Spanish settlers built a chapel in St. Augustine, Florida, and dedicated it to New World Mothers under the title of Nuestra Señora de la Leche y Buen Parto (Our Nursing Mother of Happy Delivery). The shrine houses a small replica of Spain's most prized Madonna, Our Lady of La Leche. She will deliver and nurse us. The kinship of faith that unites us with our Mother 'in the order of grace' takes its quality and strength in part from the fact that Mary's glorified heart is immersed in God's grace. Precisely, to be immersed in God's grace with her is both delivery and nursing for all of us. On this memorable day let us greet the Assumption as the true Mother of the New World in Christ and let us wish each other a happy delivery into the fullness of times, our own and that of all faithful Marian pilgrims.